When you move to a new home, one of the most important things to do is notify your friends and family as well as your various service providers like credit cards, utilities, and the postal service. Sending notification with enough lead time will allow you to avoid the inconveniences of missing mail and gaps in service at your new home. How soon should you notify contacts of a change of address when moving? When you select your new home and begin a moving plan, you should immediately start thinking about who you need to notify. Make sure you have ample time to change your address with all parties. Use our convenient checklist of who to notify when you change your address and when. Get a printable change of address checklist here. Credit card companies, especially if you receive your bill through the mail. Do this before the next billing cycle to prevent your personal information being sent to your previous address. Your bank and loan providers. Again, this is a notification that should happen sooner rather than later, especially if your monthly statements and bills come through the mail. Insurance providers. In addition to making sure you don’t miss any monthly bills and other important notifications you receive by mail, you may also need to check if your current healthcare providers do business in your new location. Utilities.Your electricity, natural gas, water and other utilities usually require a few business days to transfer or turn on your service, so give them enough notice to avoid any interruptions in service in your new home. You can normally choose the date on which to turn on or transfer services. If you will need to shop for a new provider, give yourself extra time to do that as well. Internet and cable. While not as vital as your utilities, giving these providers enough notice will avoid inconvenience and help you keep your kids occupied while you unpack. These providers also usually allow you to choose a service transfer date. 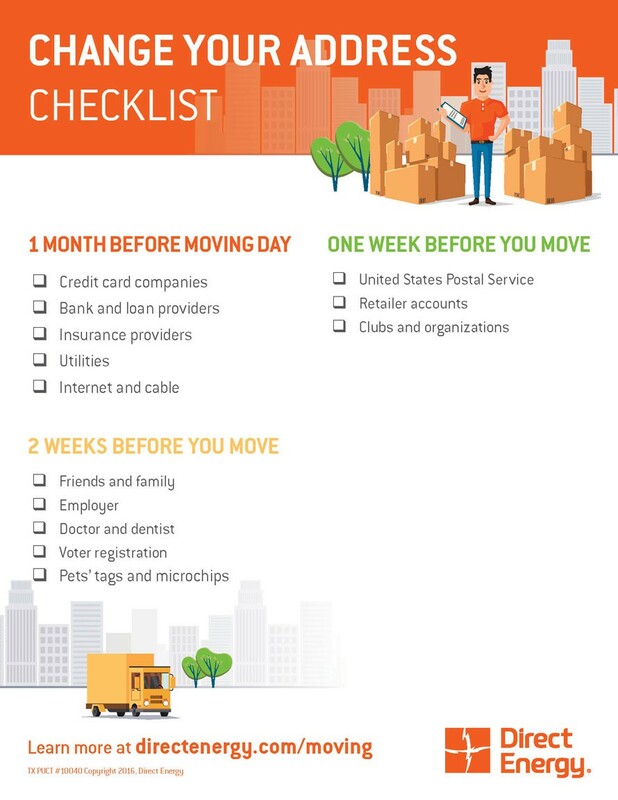 If you are moving to an area that your provider does not serve, make sure to leave enough time to find a new one. Friends and family, especially if you expect to receive an event invitation or package in the near future. Employer, so that you don’t miss any important documents sent through the mail, like paystubs, benefit or tax information. Doctor and dentist so they will have your new address on file for any bills ore reminders they need to send you. United States Postal Service. This is very important as they can forward your mail if any is received for your old address. The USPS allows you to select a forwarding date, so you can give them ample notice of when to start. When you submit your change, you’ll get a welcome kit at your new home with coupons to various retailers in your area. Retailer and payment system accounts, especially those where you have a one-click or quick checkout set up. You don’t want to accidentally send your purchases to your old address! Clubs and organizations from which you receive mail, so you never miss an event or update.